In 2014, a news story erupted over a dispute between Netflix and Comcast over connectivity and distribution. Comcast was accused of deliberately blocking or restricting Netflix traffic. However, there have been conflicting reports, that indicate that it was just a specific, infrastructure problem (see the "What's really happening with Netflix traffic?" section). In other words, Netflix is attaching a fire hose to the Comcast network, which is only equipped to handle connections the size of garden hoses. The gushing fire hose of content can't possibly be funneled into the few garden hose ports that are available. So packets are dropped and the service is degraded. Netflix could fix this problem in one of two ways. It could pay for a fire hose connection instead of taking the garden hose connection that it can get through a standard peering relationship with Comcast. The large connection would accommodate the Netflix traffic. The other option is to distribute its traffic more evenly among other CDNs that are delivering traffic to Comcast. In this case, the video traffic could get onto the Comcast network via the many garden hoses already connected to the Comcast network. 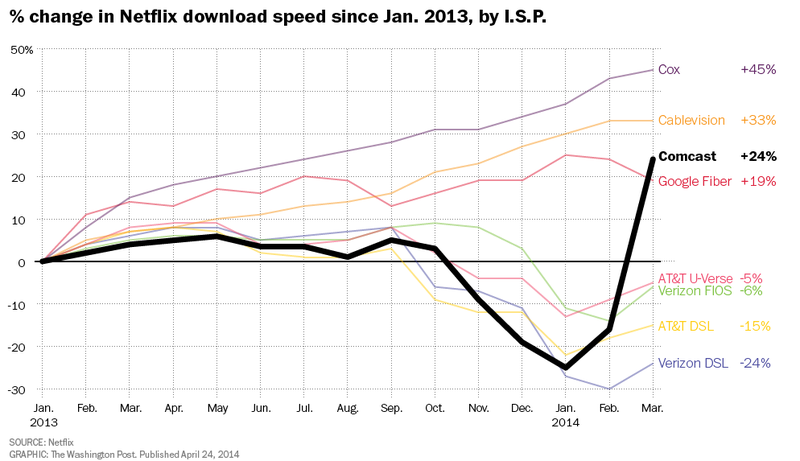 So, did Comcast do something to throttle Netflix's bandwidth? Browse other questions tagged united-states economics networks net-neutrality . How much does an ISP pay for traffic? Is the US economic downturn slowing scientific research? Did JFK Attempt to eliminate the power of the Federal Reserve Bank to loan money to the US?